Tracking and interpreting performance is an important part of the financial planning process. It allows you to see how your portfolio has changed over time and how that change compares to an appropriate benchmark. Often during a review meeting, a new client will ask, “What does Time-Weighted Return mean?” The short answer is that Time Weighted Return (TWR) is a method of calculating a return that is not influenced by contributions or withdrawals, which I believe, makes it better for comparing portfolio returns with an appropriate benchmark. While true, this brief description does not provide a lot of context to fully grasp how this type of return fits in the bigger picture. Some investors focus more on another type of return called the “Dollar Weighted Return (DWR).” This method is affected by the timing and size of contributions and withdrawals made during the period. As such, the DWR is influenced by investment performance but also includes an element of chance. Both returns are important to understand as they each provide a point of reference when answering different questions. 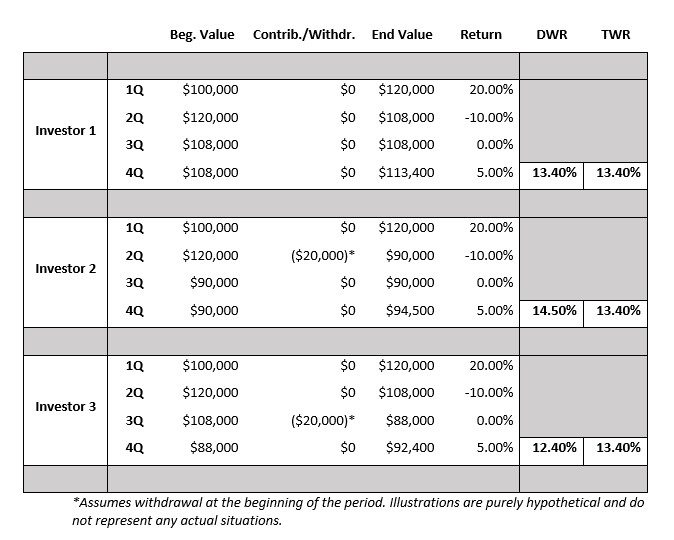 To help illustrate how these returns can produce different results over the same time-period, the chart below summarizes three hypothetical investors and their corresponding DWR and TWR. All three investors begin with an account balance of $100,000. Investor 1 has no contributions or withdrawals. Investors 2 and 3 each have a $20,000 withdrawal during the period, but at slightly different points. All three have the same TWR, however, none have the same DWR. The TWR is calculated based on the 20%, -10%, 0%, and 5% returns, which are the same for all three investors. Since TWR is not affected by the withdrawals, in my opinion, it is a better comparison against an appropriate benchmark. It is important to understand how a portfolio performs against a benchmark index. Many people believe positive returns are good and negative returns are bad. We certainly invest with the objective of having a positive return over time. However, when the markets are down 10%, a negative 5% return for a portfolio is not a bad return. Likewise, when markets are up 20%, a positive 5% return is not a good return. An appropriate benchmark provides a sense of how the financial markets performed during the time frame being evaluated. What is an appropriate benchmark for my portfolio? The financial press reports the return of the S&P 500 Index frequently when talking about the equity market. Very few investors have 100% invested in equities. Most investors have some funds invested in equities, bonds, and cash. The S&P 500 Index mostly tracks performance of large U.S. equities. A properly diversified equity portfolio will contain international equities and small and mid-sized U.S. companies. S&P started a series of balanced equity and bond indices in 2011 to provide investors a choice of benchmarks to follow based on the amount of risk in their portfolio. You should talk to your financial adviser about an appropriate benchmark for your portfolio.